Miller Middle School Student Council members talked to the School Board during the Nov. 16, 2015 meeting. Addressing the board, from left, were, Kaylee Foth, Kaci Uhde, Carson Beals, Hunter Youngblood, Mackenzy Scales and Donovan Gavagan. Miller Middle School Student Council members updated the board on many of their activities. The group talked about their community service, their roles on the council, events they have hosted and leadership skills they are learning. The group made the transition from a club to a council, which is now student-led. Students speaking on behalf of the council at the meeting were Kaylee Foth, Kaci Uhde, Carson Beals, Hunter Youngblood, Mackenzy Scales and Donovan Gavagan. Superintendent Dr. Marvin Wade gave an overview of the responsibilities of Central Office management staff. He said many of these duties revolve around strategies of the Strategic Action Plan. Many of the broad duties of Central Office management staff can be found here. Dr. Wade gave an overview of his work the past two weeks to move the district forward. This work included visiting all of the schools, meeting with business leaders, meeting with other superintendents and much more. He also talked at length about the Professional Learning Day held on Nov. 13, which received positive feedback from staff. This Super News will be a monthly agenda item during board meetings moving forward. Director of Business Operations Brian Bartz said this is an application for 2015 Modified Supplemental Funding for Open Enrollment Out and Limited English Proficiency Instruction Beyond Five years. The total Modified Supplemental funding is $1,434, 267. The request was approved by the board. This if for Special Education Administration Costs associated with the River Hills Consortium Program for 2016-17. The application is for $2,810.18. The board approved the application. Director of Buildings and Grounds Rick Simpson and District Architect Dave Schulze of TSP presented to the board. This project at Hoglan involved storm water control and the addition of air conditioning. The project is now substantially complete and was led by general contractor Hay Construction of Marshalltown. The board approved the project as substantially complete. Mr. Simpson and Mr. Schulze talked about this item. This proposed project is in the works to allow for better audio and visual equipment to be in place in the board room, especially during board meetings. This equipment would enhance the ability to hear the meetings for guests and the people watching the broadcast and allow for better interaction between the board and guests. They talked about the set up in the board room, the equipment and options for the board. The scheduled receipt of proposal date is Dec. 14, with possible installation over the holiday break. The board approved the scope of work, budget, and implementation schedule for the audio/visual upgrades to the board room and will await proposals. 409.3-R2 – Licensed Employee Family and Medical Leave- No changes- marked as reviewed. 504.14-R – Harassment- Student (Investigation Procedures) – Accepted policy as amended, waived second reading. 802.7-R – Energy Conservation Guidelines – Accepted policy as amended, waived second reading. 409.3R1 – Licensed Employee Family and Medical Leave Regulations – No changes, marked as reviewed. 504.14E3 – Harassment- Students (Student Handbook Provision) – Changes made, will be brought back before board. The personnel items included the early retirement of Director of Human Resources Lisa Koester, effective on May 31, 2015. “I’ve loved every minute of it,” Koester said of her career with Marshalltown Schools. Board President Bea Niblock thanked Mrs. Koester for her service. The board reported on committee meetings they have been involved in recently including the Equity Committee, School Improvement Advisory Committee, Roundhouse Art Committee and Audit Committee. The board then went into an open work session to talk about the Superintendent evaluation process. “American Education Week is November 16-20. It is the 94th annual celebration of our outstanding public schools. The theme is “Great Public Schools: A Public Right and Our Responsibility.” Having been in education for 41 years, I believe that there is nothing greater than public schools. 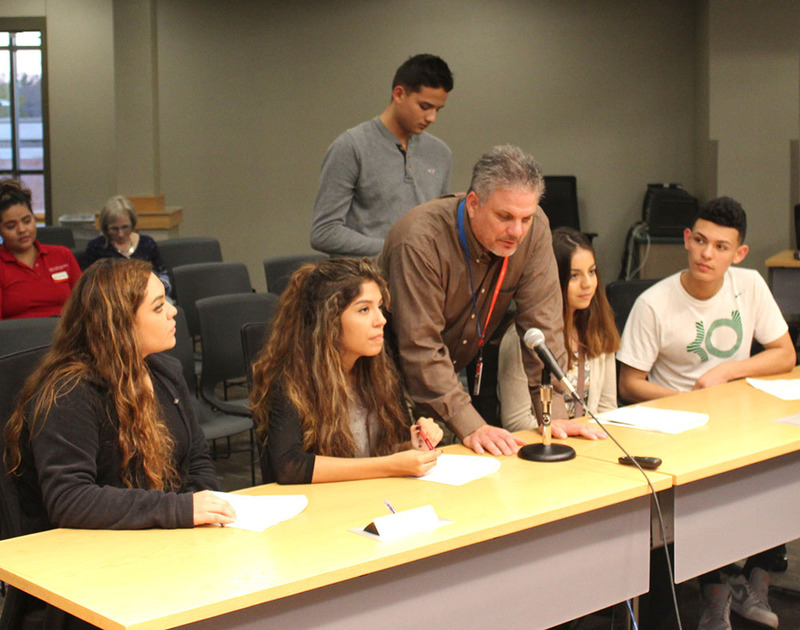 Marshalltown High School Student Resource Specialist Scott Johannes spoke to the board along with MHS students who attended a recent Latino Youth Summit. Pictured are, front row, from left, Jenny Chavarria, Martha Ortiz, Johannes, Irene Castellanos and Luis Ledesma. Back row standing is Carlos Dorado. Scott Johannes, Student Resource Specialist at Marshalltown High School brought students who took part in the Latino Youth Summit at the University of Iowa. Speaking at the meeting were Irene Castellanos, Jenny Chavarria, Carlos Dorado, Luis Ledesma and Martha Ortiz. They talked about goals such as helping out in the community, learning more about colleges and careers and other activities they have planned. The group is tentatively named the MHS 4H Club and there is a focus on building leadership. Lenihan Intermediate School Principal Kyle Young presented the annual Attendance Center Plan from Lenihan to the board. He said they are focused on four main terms in their work at the school, which are: Connected, Accountable, Tolerant and Safe. (CATS). “A lot of what we do is centered around these four terms,” Young said. Young also shared 2014-15 Iowa Assessment scores and goals in literacy and math. He also spoke on the Lenihan Action Plan to boost student achievement. Director of Human Resources Lisa Koester presented the certified enrollment figures for the 2015-16 school year. The report indicates there are 5,322 students in the district, which is down 65 students from the previous year. Koester said when looking at recent enrollment numbers, the district’s enrollment numbers are considered steady by the state. There was also a lengthy discussion on open enrollment numbers, especially the open enrollment out figure. To see more enrollment figures shared at the meeting, click here. Director of Special Services Matt Cretsinger presented a sample Individualized Education Plan to the board to help them become more familiar with the work of teachers in special education. Each special education student in the district has an IEP to guide the district in providing services to meet their needs. Superintendent Dr. Marvin Wade gave an overview of the Strategic Action Plan. To view the plan, click here. The plan process began with community meetings and other meetings to narrow the focus of the plan. The plan was approved in March 2012 by the board. The plan’s one main goal is to increase student achievement. Dr. Wade talked about the objectives under the goal and some of the indicators under these objectives. The plan was originally set up to run through June 2015, but this past year it was extended one more year. The extension was due to state indicators to be released in the next year and the new state assessment to come on board next year. 310.4 – MCSD Organizational Chart – The policy was put on hold. At a future board meeting, the Central Office Administrators roles and responsibilities will be presented. 802.7-R- Energy Conservation Guidelines – Changes made on policy, more may need to be made, will be brought back. 504-14-R – Harassment – Student (Investigation Procedures) – Changes made, will come back at next meeting for first reading. For Personnel Items approved at the meeting, click here. Andrew Potter, Communications Director, said the MHS girls will compete at the state swim meet this weekend at the Marshalltown YMCA-YWCA. Included in the state-qualifying group is Raechel Hannam who broke a school record in the 100 breaststroke last weekend in Johnston. Other state qualifiers include Emily Vest, Shakira Herrera, Zoe Beals, Taylor Hrabak and Lena Sporing. Also, the MHS drama department will perform the fall play “Almost, Maine” this Friday and Saturday at 7 p.m. in the MHS/Community Auditorium. Included in board member comments were a variety of things. Students who attended the Latino Youth Summit at the University of Iowa in October made a short presentation of the knowledge that they brought back to the district and how they were translating that into community service and exploration of careers. We hope that anyone who attends a training brings information back to our district that enriches what we do. Also mentioned was the learning that occurs when volunteers work in our buildings – learning to the students and to the volunteers alike. A small group of Emerson/Fisher employees are reading with students at Lenihan Intermediate School. It’s a win-win situation with both students and volunteers being enriched. Volunteers in the buildings help spread the word into the community of the great learning that is going on each day.